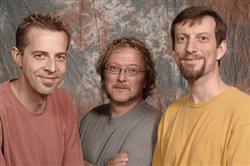 The Matrix Percussion Trio was founded in 2005 by Joe Smyth, Todd London and Scot Corey. Since that time they have performed and presented educational programs in the Nashville area for public schools and master classes and concerts for the Tennessee Arts Academy, Belmont University, and the Blair School of Music at Vanderbilt University. For the past 5 years the Matrix Percussion Trio has brought their school educational program, “We Are the World: Percussion around the Globe,” to greater Nashville schools. The trio has given 75 school presentations to a total audience of more than 30,000 elementary and middle school students. In 2007, the trio was awarded a Zildjian Family Opportunity Fund grant, and received Berklee College of Music Alumni Grants in 2008 and 2010 for their educational programs. The Matrix Percussion Trio believes passionately in the power of their percussion music programs and performances to challenge, stimulate, entertain and educate audiences, both young and old. The members each bring to the group special skills and experiences in various styles of music performance. All three being educators as well as performers, they are linked by a strong desire to educate through performance and inspire students to strive to meet their potential as aspiring musicians.